Jamie has not seen her friends all summer and plans on telling them about her gender identity. Her two moms drop her off at her friend’s house as all of her buddies are starting to play a game. They will be princes and will save a princess form distress. 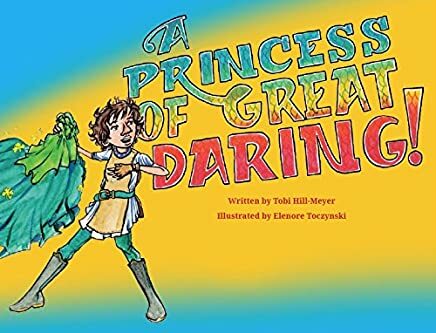 Jamie says she would like to be a princess and the boys are excited to have someone to rescue, but she interrupts the traditional narrative declaring that she will be “a princess of great daring.” Concerned that they will have no one to rescue, one of the boys, Liam, volunteers to be captured by a dragon. During the ensuing fun, the children create a rescue scenario that shatters gender stereotypes. Even the dragon, Jessica, defies expectations. She grabbed Liam, not to eat him, but because she was lonely. When the game ends Jamie’s friends tell her she makes a great princess. She takes the opportunity to explain that she is actually a girl. In addition to immediately accepting her, Jamie’s friends ask how they can support her. She explains the importance of using correct pronouns. This is a fantastic book from Flamingo Rampant Press. It shatters stereotypes at every turn. Jamie’s moms are an interracial lesbian couple, and her friends are equally diverse. This is a fun book to read with kids, and like all Flamingo Press publications will make a great addition to personal and school libraries.